A Bilingual Blog: Thank you, Donald Trump! Jeb Bush: out. Lindsay Graham: out. Ben Carson and Chris Christie: also out. Who will be the next one to go? Will it be Jon Kasich or Marco Rubio? The Republican Party: the elephant, the anti-immigrant force of the United States, is convulsing, has hit a wall, and it seems like its establishment does not know what to do next to have a realistic shot at winning the presidency. And the reason of all of this is its front runner, Donald Trump, and his supporters, who have turned this political machine on its head. "My party has gone batshit crazy," Republican senator Lindsay Graham said during a Washington Press Club Foundation dinner last month. "How did I lose to these guys?" Mr. Graham happened to be one of the best candidates this party had, along with Ohio Governor John Kasich, but their credentials did not matter to the hard-core conservatives of the party, who instead have gone for "The Donald," who says whatever comes to his mind first, and Ted Cruz, a fairly new senator who shut down the Federal Government over his opposition to the Affordable Care Act, a law thanks to which millions of people have been able to get health insurance. Trump started his presidential campaign by attacking Mexico, something that has many terrified, and pledging to make America great again. Before a crowd of about 3,000 at Phoenix-Mesa Gateway Airport, during one of his rallies, and with the song "We're Not Gonna Take It" in the background, he told his crowd: "So, we're going to build a wall, and Mexico is going to pay for the wall. They're gonna pay for it." During all of his rallies, he always asks: And who is going to pay for that wall? The which the crowd, energized, responds: Mexico! What a way to try to bring Hispanics to your side. And Mr. Trump has also targeted other minorities. He claims that after the September 11th attacks, Muslims went out in the streets of New Jersey to celebrate. "It's not only that the facts are wrong," Andrea Mitchell from NBC said in #MeetthePress. "It's that what he is saying is so emotionally and politically powerful. He is lighting fires. He is turning people against people. He is misstating the facts of what's happening domestically." I am loving the Republican presidential campaign. Finally, the true feelings of the neo-conservative base of this political force are out there in the open for the world to see. But its moderate voices are very concerned. That is why this week, former presidential candidate Mitt Romney started a full-front attack: "If Donald Trump's plans were ever implemented, the country would sink into prolonged recession. Look, his bankruptcies have crushed small businesses and the men and women who work for them. And whatever happened to Trump Airlines? How about Trump University? And then there's Trump Magazine, and Trump Vodka, and Trump Steaks and Trump Mortgage. A business genius he is not." Republicans are pouring millions into attack ads against Trump, and the feud keeps growing. 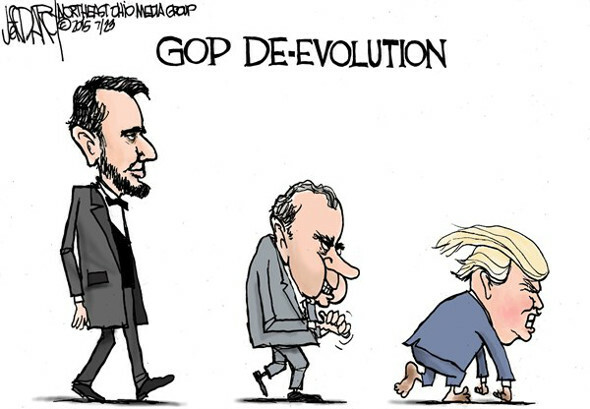 Republican economist and New York Times columnist, David Brooks, has also joined: "Finally, finally someone (Romney) is beginning a sustained attack on Donald Trump," he told Chuck Todd today. "And to me, every Republican office holder, if they want to save their party, has to continue that attack. He (Trump) is a betrayer, and he's a narcissist, and he thinks ultimately only about himself. I say let Donald Trump be the Republican nominee. Let's see if the people of the United States will vote for a candidate that wants to send them back to the times of deep racism and division. Let people see the difference between them and the Democratic Party, where issues are really discussed, and candidates do not attack each other as if they were on the Jerry Springer show. I think the voters are smarter than that. "Hispanics don't like our message on immigration. I don't think they're gonna like self-deportation better," Graham continued to warn today. "At the end of the day, Donald Trump has taken any problems we have with Hispanics and young women, and made them worse. I cannot tell you the damage that Donald Trump would do the Republican Party if he carried our banner, because he has run a campaign on xenophobia, race-baiting, and religious bigotry. That cannot be Republican conservationism."